Light: Listening to your feelings and intuitions. Exploring unconventional spirituality. Keeping secrets. Being receptive. Reflecting instead of acting. Observing others. Preserving purity. Shadow: Being aloof. Obsessing on secrets and conspiracies. Rejecting guidance from spirit or intuition. Revealing all. Ignoring gut feelings. Refusing to become involved, even when involvement is appropriate. Mythical/Spiritual: The feminine aspect of divinity, particularity when expressed through virginity, as with the Virgin Mary or Isis. Story: An unexpected event contains seeds of discord with potential to disrupt the main character’s everyday world. Relationships. Your heart is your best source of information now; listen to it. Set, communicate, and respect sexual limits. Don’t tell everything you know; one element of attraction is mystery. Still, don’t be a puzzle; communicate your needs and the reasons for them. Watch and learn. Work. Play your cards close to the vest. Reveal your insights to a chosen few. Rather than take rash action now, keep still and observe. Hold your tongue and learn by listening. Listen to your gut instincts. When the time comes for action, you’ll know. Spirituality. The unconventional image of a papess recalls the legend of the heretical, cross-dressing Pope Joan, whose true gender was revealed when she unexpectedly gave birth. Consider alternative spiritual paths or nontraditional applications of your familiar faith. Personal Growth. Learning to listen can be the most difficult lesson of all. Invest energy in the transformational discipline of silence. Disengaging from the drive to respond will free you to reflect. As an observer, you will see patterns participants will overlook. Fortune Telling. A mysterious woman arrives. A sexual secret may surface. Someone knows more than he or she will reveal. The scroll of the law. Often, the Papess or High Priestess holds an unopened book, occasionally labeled TORA (“law”), an anagram of TARO. What laws govern your situation? Have they been expressed, or kept secret? The lunar crescent. 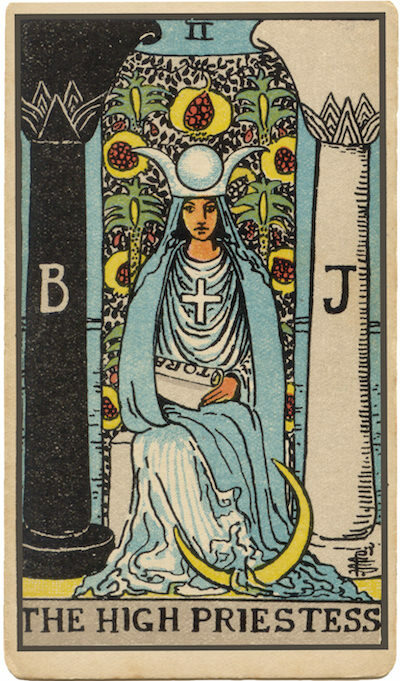 The Priestess is closely associated with the moon and, by extension, with all lunar cycles (including menstruation). Which cycles are at work in your situation? Boaz and Jachin. The B and J often seen on the columns to either side of the Priestess are the two pillars of Solomon’s Temple. Their names mean “in strength” and “God will establish.” What might God (or the universe) be using your strength to establish? The pomegranate veil. Symbolizing fertility, pomegranates connect the Priestess with the myth of Persephone, whose consumption of three pomegranate seeds linked her with the underworld. The veil is the veil of the temple, symbolically marking the division between the realm of humanity and the realm of God. Might the seeds of this situation have been sown by a belief in an obstacle between you and the Divine? The waters. The water often seen behind or beneath this archetype represents the unknown depths of the subconscious mind. What is your intuition telling you? What might a rebel against tradition do? What isn’t being said or revealed? What could be achieved by observing and reflecting?